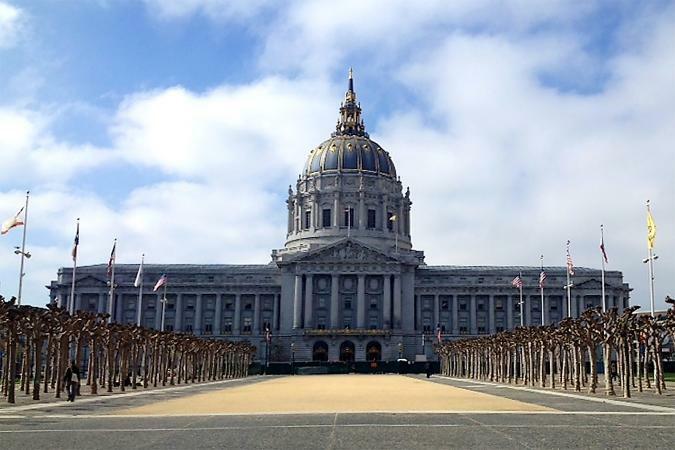 San Francisco City Hall is among the nation's most architecturally notable seats of city government and it is popularly used for civil weddings. 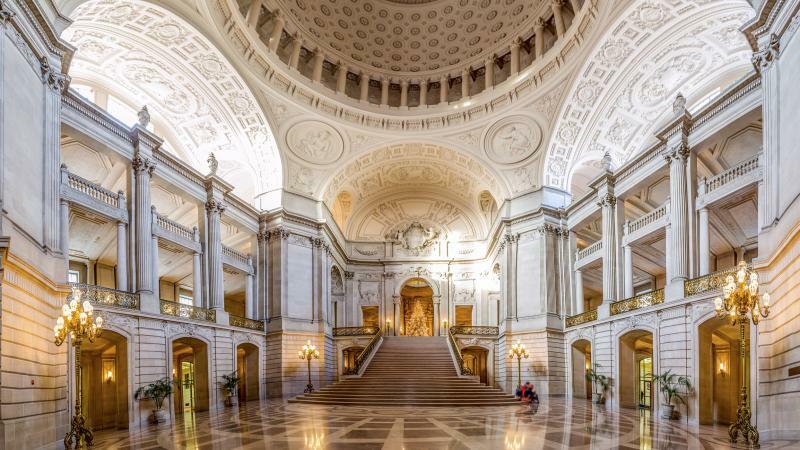 With its impressive rotunda and grand staircase beneath a gold leaf dome that's taller than the U.S. Capitol, the building is elegant and stately. Marilyn Monroe and Joe DiMaggio were married here in 1954. 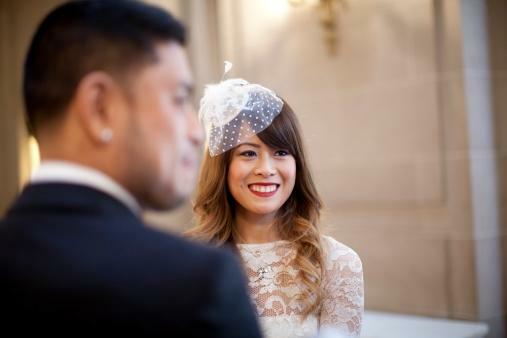 Weekday weddings are officiated by a deputy marriage commissioner from the San Francisco County Clerk's office in 30-minute slots on the half hour between 9:30 a.m. and 3:30 p.m. Beforehand, there's a procedure that begins with making two reservations: one for the marriage license and one for the civil ceremony. Two unmarried people over the age of 18 may obtain a marriage license from the county clerk at city hall in room 168 on the first floor. Neither a California residency nor a U.S. citizenship is required, although both people must attend the appointment and present a valid, authentic picture ID bearing their full legal name and date of birth. Examples include a passport, birth certificate, driver's license, naturalization certificate, resident alien card or military identification. A weekday appointment may be reserved online or in person for a license that remains valid anywhere in the State of California for 90 days thereafter. The fee of $104 is paid at the time of booking in cash, money order, credit card, or debit card in person, or by credit card online. When booking the time slot for a ceremony at city hall, the fee is $83 collected at the time of scheduling. Use cash, money order, or debit card only in person and Visa/Mastercard online. In case of a change of plans, a onetime adjustment on the wedding time and date can be accommodated at least three business days prior. However, refunds are not possible and rehearsals cannot be entertained. As city hall is a public building, anyone is welcome to have a look around on weekdays from 8 a.m. to 8 p.m. On the day of the wedding, everyone should arrive 10 minutes prior to the ceremony time slot. Late arrivals of more than 30 minutes will likely mean a re-scheduling is necessary. Bring your paperwork. Anyone with a previous marriage will be asked to present a certified copy of the divorce decree, annulment, termination, or death record on an original court seal with a signature or signature stamp of the court clerk. Anyone who wishes to change their name following marriage should be prepared to supply that information at the time of obtaining the marriage license. Plan ahead. Reservations can be made up to 24 months in advance or you may get your marriage license on the same day as your ceremony. Reserve both appointments in advance, leaving 60 to 90 minutes between them. Friday afternoons are the busiest time, and Monday mornings are among the slowest times. Invite a friend or two and make certain at least one is on time. One witness provided by the couple is required at the ceremony and two signatures must appear on the marriage certificate. The officiant cannot sign but you may ask a photographer to be a witness. A maximum of six guests may attend the ceremony, including a photographer, videographer, children, and others. Remember to bring the marriage license. Remember, city hall is a public space. Brief civil ceremonies typically lasting under 10 minutes take place under city hall's rotunda on the second floor at the top of the grand staircase. As many as three couples may be married within each half hour slot. Other spots around the building may be reserved for a private ceremony at an additional fee, given advance notice. A $1,000, one-hour private ceremony held on the mayor's balcony or in a fourth floor gallery can accommodate up to 100 guests with two weeks' minimum notice. A $5,000, two-hour wedding package for 200 guests is offered on Saturday mornings and early afternoons to take place on the grand staircase under the rotunda, also with two weeks' minimum notice. More elaborate evening weddings with dinner and dancing can be planned with four weeks' minimum notice on any available night of the week. Wedding packages may cover rent, insurance, security, and chairs but will attract fees for some mandatory and optional additional services. Only qualified vendors may be used at city hall weddings. A car and driver is always a good idea for an occasion such as this. Alternatively, a public parking garage is underneath Civic Center Plaza. The buildings entrance is on McAllister Street, between Polk Street (known as Dr. Carlton B. Goodlett Place on that block) and Larkin Street. City Hall is also close to Civic Center station, served by public transportation on both BART and Muni trains, with Muni buses stopping along Van Ness Avenue at the back of the building. Some couples choose to arrive on a vintage streetcar. Conveniently, the F Line travels along Market Street and stops about three blocks south of San Francisco City Hall. Once the knot has been tied, newlyweds and their guests may choose to continue the celebration nearby. A number of good restaurants and bars are within walking distance of San Francisco City Hall, most notably in Hayes Valley. Absinthe Brasserie has a private dining room, Zuni Cafe has wood-fired oven roasted chicken for two, Plaj has a welcoming fireplace, Jardiniere is romantic, Rich Table has a Michelin star, Sauce has overnight guest accommodation upstairs above the cozy restaurant, and The Riddler is a champagne bar.